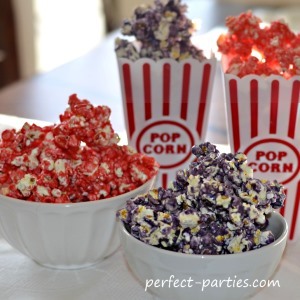 Candy Popcorn Treats for Any Party Theme! Just add your favorite flavor of Koolaid to flavor this treat. Makes a cute party treat and there are a nice variety of colors to choose from. You can enhance the color by adding a couple drops of food coloring or leave it a more pastel shade. We looked at a few recipes online and made adjustments of our own. Adding more popcorn will make a lighter more crunchy coating, less a thicker slightly chewy taffy consistency. Large Pan sprayed with cooking spray. We used a deep foil pan. Medium Pot 2 Quart for one batch, larger if you are doubling. 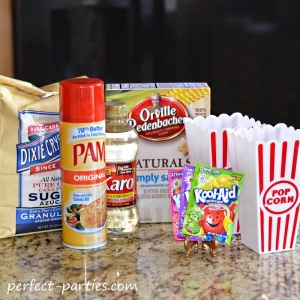 Pop popcorn and pour into pan prepared with Cooking Spray. Remove unpopped kernels. Once coated with candy, it will be difficult to see the kernels. Put Kool-Aid powder and baking soda in a small dish. Put sugar, syrup and butter/margarine in pot on medium heat. Add a couple drops of food coloring if you want a deeper color. Heat until boiling and let boil for 3 minutes stirring continuously. Remove pot from heat and add Kool-Aid/Baking Soda mixture. Stir. The mixture will expand so this is why you need a medium sized pot. Using the spatula or spoon, pour mixture over popcorn. Mix gently with wooden spoon until evenly coated. Bake in oven stirring every 10 minutes. Repeat this step 3 more times for a total of 40 minutes. Remove popcorn from oven and let cool. While still warm, break apart into pieces. If it cools too much it may crush pieces when you break it apart. Vary the amount of popcorn to your taste. Use 3 Quarts (12 cups) popped for heavy coating, with a chewy texture. Use 12 cups for a medium crunchy, some chewy pieces. I added an extra 10 minutes with the oven off for a more crunchy coating. Half way through the baking process I poured the popcorn on a piece of parchment lined cookie sheet. I felt that it was not hardening as quickly as I would like it to. For comparison, I left the grape batch in the pan and it was a little less crunchy. Please note that if there are kernels in the popcorn when the Kool-Aid mixture is poured on it, it will be very hard to see when coated so I do not recommend this for young children. Soak pots, pans, and wooden spoons immediately in hot water for easier removal of candy popcorn coating. Double recipe for a party, or make a second batch with a different flavor like we did.